SATURDAY, May 28, 2016 (HealthDay News) -- Picnics and barbecues are a big part of Memorial Day weekend, but keeping foods safe to eat at these events can be a challenge. The first step is to wash your hands before and after handling any foods. If you're outdoors and don't have access to soap and water, bring along hand sanitizer that contains at least 60 percent alcohol, recommended Torey Armul, a registered dietitian nutritionist. "Also, remember to regularly clean your cooler, picnic basket and tote bags because these items can be a breeding ground for bacteria," said Armul, a spokesperson for the Academy of Nutrition and Dietetics. If you plan to cook food at your picnic site, separate raw meats, poultry and seafood from ready-to-eat foods, she advised in an academy news release. "Use one cooler for raw meats and another one for ready-to-eat foods, such as fruits, vegetables, cheese and desserts. Bring two sets of plates and utensils: one for handling raw meats, and one for serving cooked foods," Armul said. Keep your cooler in the shade with the lid closed. Place a thermometer in the cooler to be sure it remains at 40 degrees Fahrenheit or below, she suggested. Use a food thermometer to ensure that food is cooked to a high enough internal temperature to kill harmful bacteria. Ground meats should be cooked to a temperature of at least 160 degrees F, according to the U.S. Department of Agriculture (USDA). 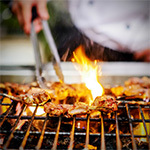 The USDA advises that chicken -- including chicken breasts and ground chicken -- should be cooked to 165 degrees F, while steak should be cooked to a minimum of 145 degrees F.
After the meal, throw away all perishable food that has been unrefrigerated for more than two hours or just one hour if the outdoor temperature is over 90 degrees, Armul said.